For 13 years, from 1981 to 1994, restorers worked to remove centuries of soot and candle smoke from the famous frescoes of the Sistine Chapel, including those created in the early 16th century by Michelangelo. After layers of varnish and grime covering the frescoes disappeared, the newly vibrant ceiling and walls of the chapel showed a modern world what Michelangelo’s work might have looked like soon after it was completed in 1512. Not only were the colors of the frescoes revealed to be much brighter, but even individual brushstrokes were visible enough to be compared to the styles of other artists. Although restoration work of this kind can stir up controversy, as some would prefer not to risk damaging delicate artworks, or may disagree about the best method for restoring them, there is something extremely compelling about seeking to return old objects to their original states. It’s not possible for us to know what it was like to stand and watch Michelangelo at his work 500 years ago, but it is fascinating to imagine it. Of course, restoration is not limited to famous paintings; ancient buildings also often undergo painstaking restorations. One such example is the castle of Saint-Fargeau in Burgundy, France. Built in 1453 on the foundations of a fortress dating from the 10th century, the castle now draws in large numbers of visitors who view epic historical reenactments on its grounds. The man behind its restoration, Michel Guyot, has another project currently underway: the creation of an entire castle from the ground up, using the building techniques and materials of the 13th century. In the small village of Guédelon, not far from Saint-Fargeau, visitors to the castle can watch trained artisans go about their work, much as their counterparts did 800 years ago. Although seeing a restored castle can give you historical insight, the Guédelon project goes much further; with its emphasis on recreating the methods used to build the grand castles of the past, the experience could be likened to looking over the shoulder of a Renaissance artist, watching as he mixes his paints. The design of the castle was inspired by the castles built by King Philippe Auguste (or Philip II Augustus) in the 13th century. Among them is the original Louvre fortress, built to protect Paris from Viking attacks on its west side. Although the fortress was later razed to make room for a new palace, parts of its foundations remained intact (modern visitors to the Louvre can view these foundations in a special exhibition beneath the museum). Although Philippe Auguste only lived until 1223, the Guédelon project’s designers imagine its beginning construction date as being 1228, when castle designs still followed Philippe’s model. Having chosen to emulate this historical era, the specific plans for the Guédelon castle were developed by Jacques Moulin, the chief architect of historic monuments in France. Begun in 1997 with the laying of the foundations, the Guédelon project is not scheduled to be completed until 2023. When it is finished, the castle will consist of high fortress walls, with towers of varying sizes around its perimeter. Forming the backbone of the project are the 40 or so builders who quarry stone, mix mortar, and chisel rock, among other tasks, during the warmer part of the year. In spring, summer, and fall these workers put in long days of work, while the site is closed in the winter. In keeping with the spirit of the project, workers wear simple tunics that would not have looked out of place in the 13th century, although they do make use of modern safety equipment such as goggles, helmets, and harnesses. Both the materials they use and the techniques they employ are limited to those used by builders of the 13th century. The area around the construction site provides all the necessary materials for the project, including sandstone, wood, iron, limestone, earth, and hemp. Sandstone is quarried near the site, using only hand tools (such as sledgehammers), and then carried by horse-cart or wheelbarrow to the area where masons wait to shape the rock with chisels and mauls. The nearby forests provide wood for a variety of uses including the production of beams, planks, levers, scaffolding, banisters, wheelbarrows, pails, and tool handles, as well as fuel for all the site’s heating needs. One of those heating needs is the kiln in which sandstone is fired for two days, before producing a lump of iron ore. Blacksmiths reheat the iron in a furnace before shaping it on their anvils into nails, tools, chains, weapons, or hinges. Likewise, blocks of limestone are heated to obtain quicklime, which is mixed with sand to produce mortar. Earth is used to produce bricks, pottery and tiles, and to weatherproof walls. Lastly, the project’s rope makers rely on hemp to create lifting ropes, belts, and harnesses. The Guédelon building site was first opened to the public in 1998, and by 2000, it was producing enough income to be self-sustaining. In recent years, as many as 300,000 people visit the site annually, and it is especially popular for groups of schoolchildren. Although the workers at Guédelon are involved in actual construction, and are not just doing demonstrations of building techniques, visitors are welcome to not only observe, but to ask questions about what they’re seeing. Education is a big part of the project, and indeed, those involved in the process are also learning as they go, testing hypotheses about how medieval castles were built. The project has recently produced its own web series, “The Fires of Guédelon,” with the first season showing all the ways fire is used in the construction, and the second season dealing with how wood is used. On a cold October day in 2012, my family and I visited Guédelon ourselves and saw first-hand the detail and craftsmanship that goes into the construction. It was amazing to see walls being built before our eyes, and to experience the site not only as a beautiful structure, but as a work in progress. To me, the most remarkable thing about Guédelon is that people are not only studying history, but are themselves experiencing what life was like so long ago. 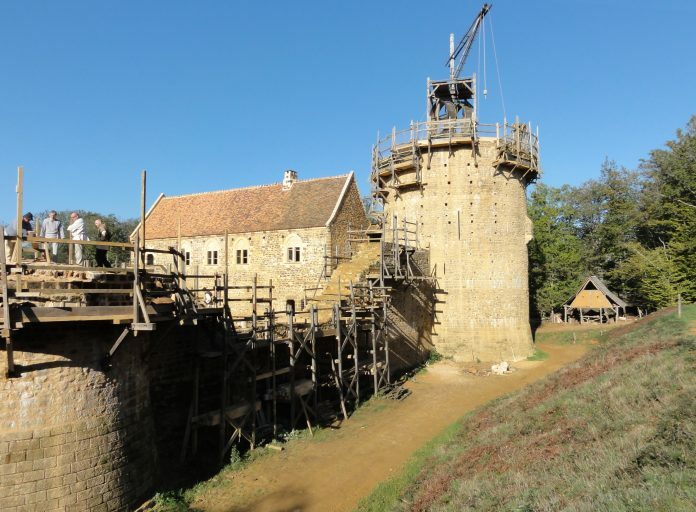 The Guédelon workers and their guests have the opportunity to feel what artisans of the 13th century might have felt, watching a medieval castle take shape beneath their hands. Note: This is an updated version of an article that originally appeared on Interesting Thing of the Day on October 25, 2006.